The Urubamba river runs from the high Andean ranges down through the Sacred Valley of the Incas, past Machu Picchu and into the jungle. It has some exciting white water depending on the section of the river being done and the time of the year. 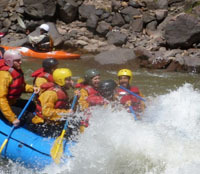 One of our most popular Rafting sections during the season is the "Chuqui" section of the river on the Upper Urubamba. 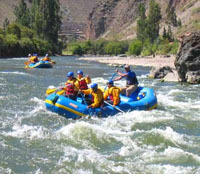 There are good class IIl rapids and the water is not contaminated, as unfortunately the Huambutio and Ollantaytambo section of the river are. We pick you up at your hotel with our private transportation , after one and a half hours drive we arrive to the put -in at the shores of "Cusipata River Camp" our private campground. 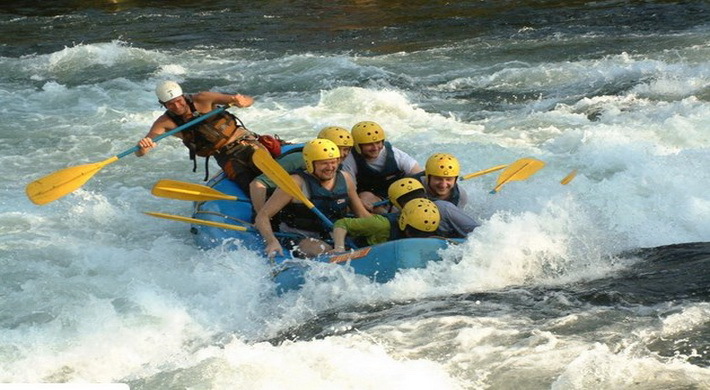 Our professional Rafting Guides will give you a safety talk and provide you with all the proper equipment for Rafting. You would be floating for approximately two and a half hours, running class I & II, introductory type rapids. Afterwards, we will drive back and spend the night at "Cusipata River Camp", where we have a thatched roof camping area with comfortable dining place, a sauna and hot tub , hammocks and excellent food. You will fall asleep under the whisper of the river. After a relaxing Sauna and a good night sleep , we get up for a healthy breakfast and drive up river to the CHUQUI section of the river, where we will be running class III, & III+ rapids . We will include some extra safety such as Kayaker or a Catarafs. After about 2 and a half hours, we arrive back to "Cusipata River camp", where a Lunch will be served. Afterwards we drive back to Cusco arriving in the late afternoon.